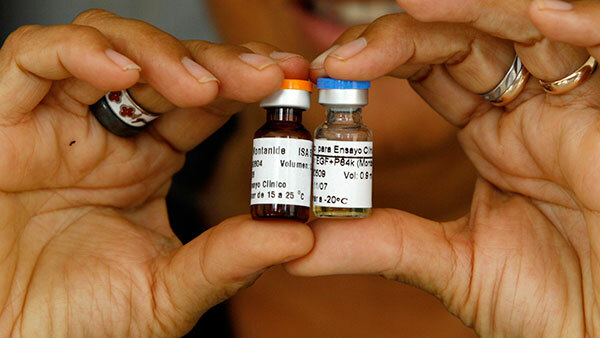 Cuban lung cancer vaccine could come to U.S.
NEW YORK (WLS) -- Thawing U.S.-Cuba relations means a Cuban-developed lung cancer vaccine, Cimavax, could soon come over to the United States, ABC News reports. Lung cancer is one of the leading causes of death in Cuba. The Roswell Park Cancer Institute in Buffalo, N.Y., is working with Cuba's Center for Molecular Immunology to bring Cimavax to America. Cimavax works by creating a protein that primes the immune system to attack a hormone called epidermal growth factor, or EGF, which is naturally occurring in the body, according to Dr. Kevin Lee, chairman of the Dept. of Immunology at Roswell Park Cancer Institute. That hormone, Lee says, can help feed deadly tumors; the vaccine can slow or stop tumor growth by essentially starving tumors of EGF hormone. Patients get one shot per month. The vaccine does not cure cancer, or put patients in remission, but can help fight the disease in conjunction with other treatments. Currently, Cimavax is approved for use in Peru and Cuba. Lee said the treatment is so easy to administer, primary physicians can give it to patients. The Roswell Park Cancer Institute hopes to win FDA approval for a phase I study in the next six to eight months. If studies show the vaccine is successful, Cimavax could be tested on other cancers that use EGF to grow quickly, including breast cancer, pancreatic cancer, or head and neck cancer.